Did you miss me? I sure missed all of you! I was on a little hiatus for the last couple of weeks, and now I'm back! 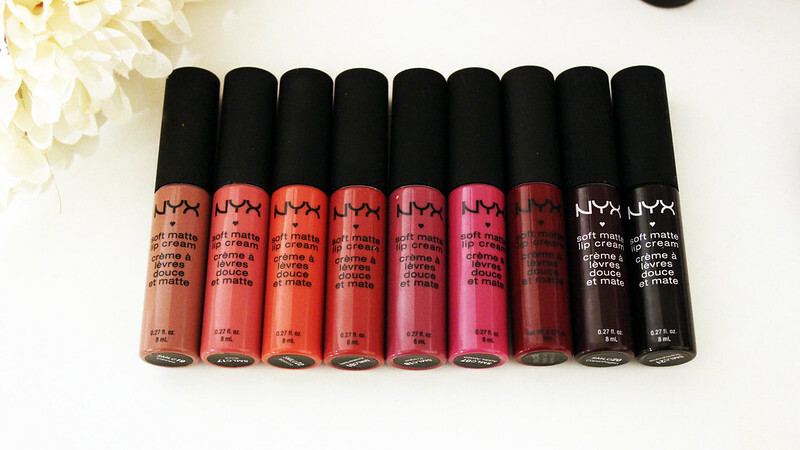 I've been slowly hunting down the NYX soft matte lip creams for the longest time ever, and I was finally able to find all the colors I wanted. Tania was the one who got me really interested in these. Check out her blog if you get a chance. I started out by trying just one (first one was Monte Carlo) and then after that first one, I just couldn't stop. I now currently own nine colors. 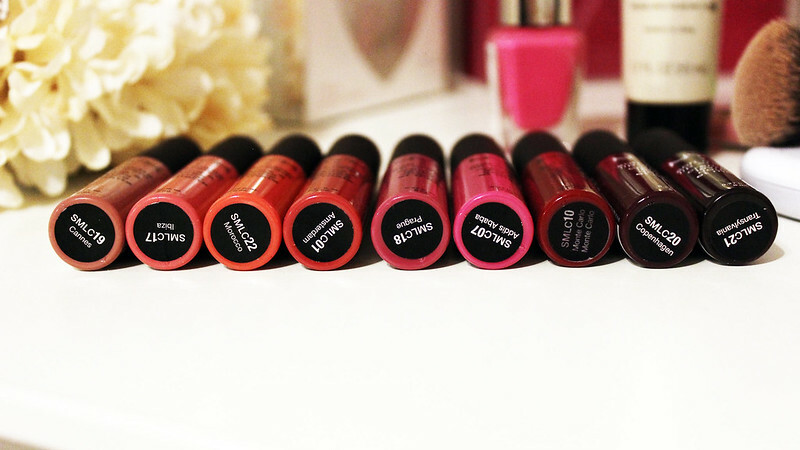 The thing I love about these lip creams is that first of all they are matte, second off, they are transfer free. Well almost transfer free. After I apply the lip cream I just leave it on, pretty much all day. No fuss, and amazing staying power. Unless you know, I'm doing some serious kissing, or eating like ribs, or some other kind of sloppy food. I had cannes on and I was kissing someone (who shall not be named) and by the end there was nothing left, except for a stain, but that's to be expected. The darker the color, the darker the stain will be. Which was why I wanted to pick up Copenhagen, and Transylvania. I had to go to another Ulta to find the last four colors that I wanted (Copenhagen, Addis Ababa, Prague, and Amsterdam). By the way Cannes was an accidental pick up from Ulta, but it grew on me, so I decided to keep it. Check out Ulta.com for their discounts. Sometimes they have 40% off or bogo 50% off. 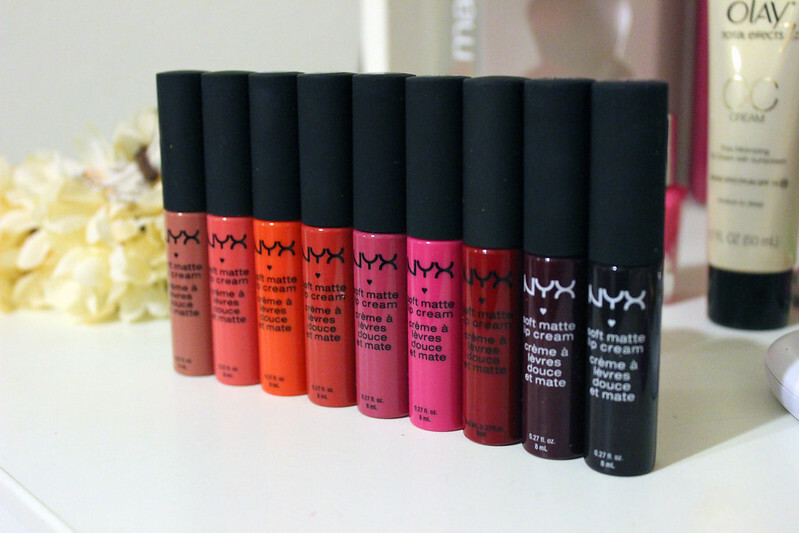 Here is a chart of what all of the colors look like on a pair of lips. 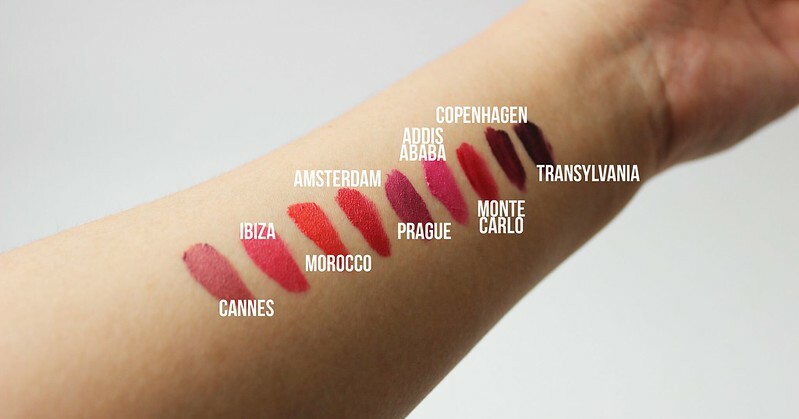 (To achieve the exact color in the picture, be sure to exfoliate and apply a lip balm beforehand) The only one that's missing from the chart is Addis Ababa. Such pretty swatches! 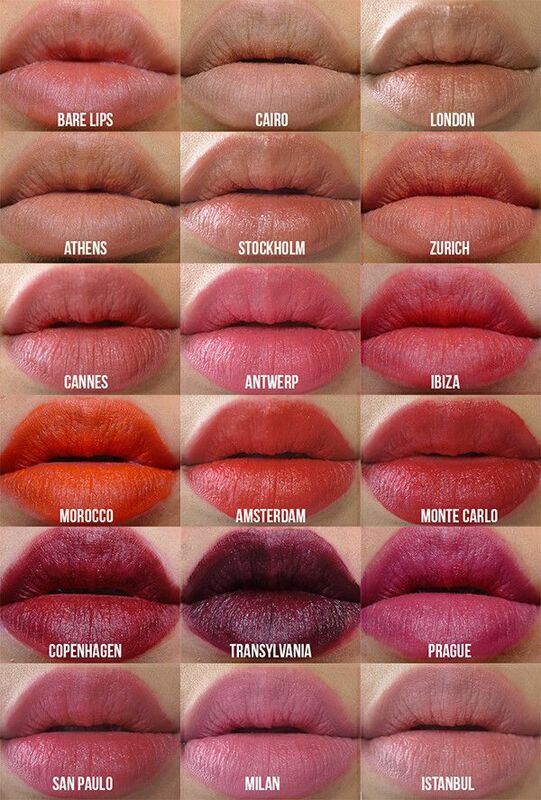 I haven't tried any of these yet but I would love to own Cannes and Prague! What what, these are matte colors? Pretty awesome! Love that!! All the best colors...I always liked their textures and would probably go for Marooco! Gosh so many fun colors! Would be fun to get them all and wear a different one each day of the week. Wow, those are so pretty. Love that each color reflects the city or country it's named after. I love that Transylvania is dark ...for Dracula! Hah! But anyway, the colors are all really pretty so I don't know if I could pick a favorite!